Here is the same crossing taken halfway across. This shot is taken looking in towards our land. 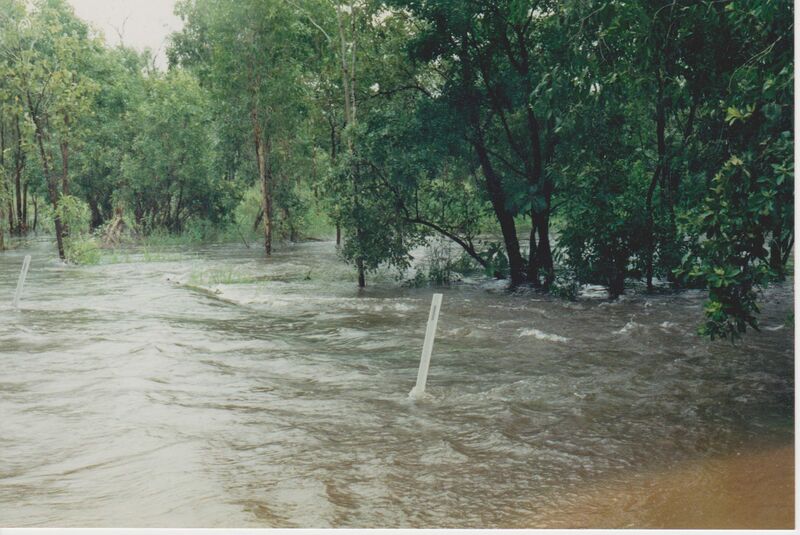 Despite this apparent abundance of water, securing a water supply was an important concern. 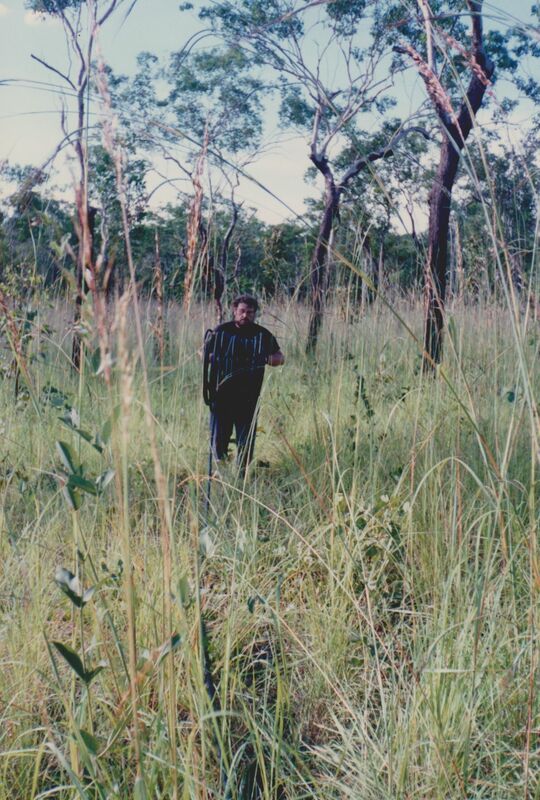 The whole area became bone dry for half the year in the Dry season when there was no rain at all. The lake remained, but all creeks in the area dried up completely, including ours. For the first little while we tried buying water for our consumption, but that clearly wasn’t going to work. We needed a supply to cook and to clean with, not just to drink. 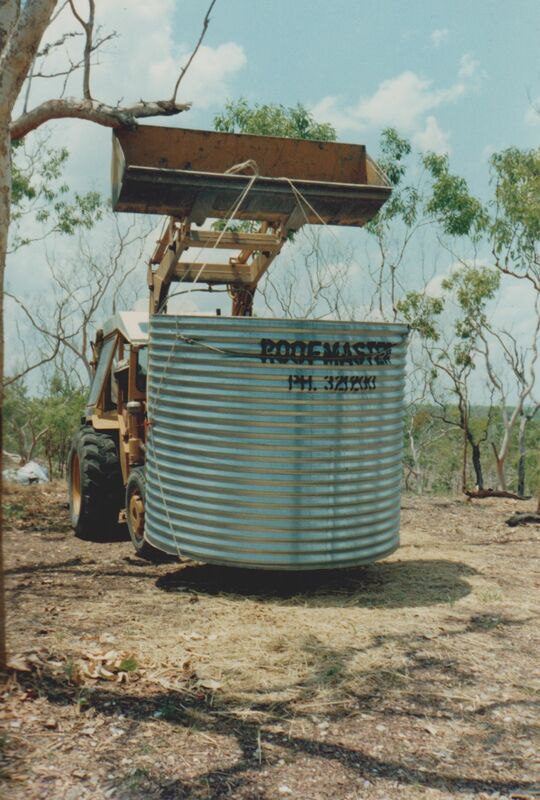 A water tank on the top of the hill was the way to go, as its position would give us good water pressure when we connected it to our campsite now moved lower down. As you can see, the backhoe was already proving its worth. An empty tank is very light, but it had been delivered right to our campsite, and rolling it up that steep hill was another let’s-not-go-there moment. The backhoe made it easier. 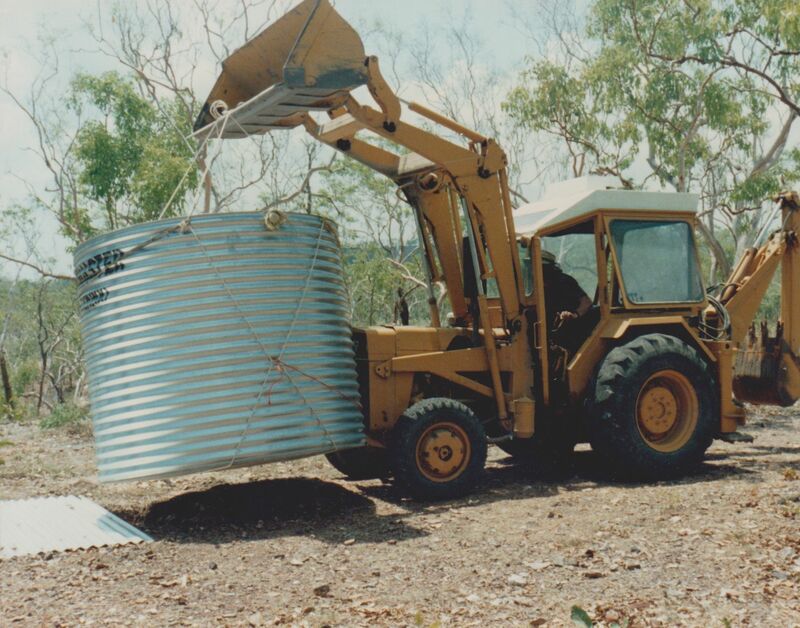 We cleared the area for it of stones and sticks, but nevertheless set the tank on sheets of corrugated iron to prevent any stones or sharp sticks just below the surface from punching a hole into the base once the tank was filled. When filled, we could test the level of water inside by tapping on the side at different levels and waiting for the sound to change from solid to hollow. But first, we had to get that water in there. 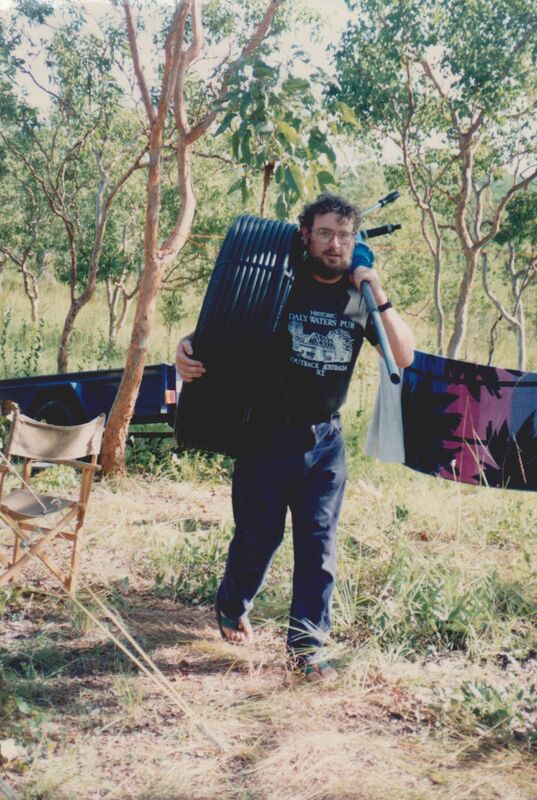 We decided that we could run a hose down to the creek and pump water up with… Yes… um… that is a hand pump Greg is holding, which rather shows just how naïve we were about the whole thing. First, the hose had to go in place. That took some doing as you can see from the next batch of pictures. Greg rolled it out from the top of the hill downward. At least we were sensible there. It was actually a long and tiring job, both of us taking turns. The attempt failed miserably. The pump managed to force water up the hose maybe twenty feet and stopped. We simply didn’t have the equipment. We needed – and got – a diesel pump to do the job for us. That was so heavy, the only way I could get it onto the back of the Land Rover was to build up the momentum of my swing. Even then I barely made it. Yes, I could have used the backhoe, but my swing was faster, so long as it worked. 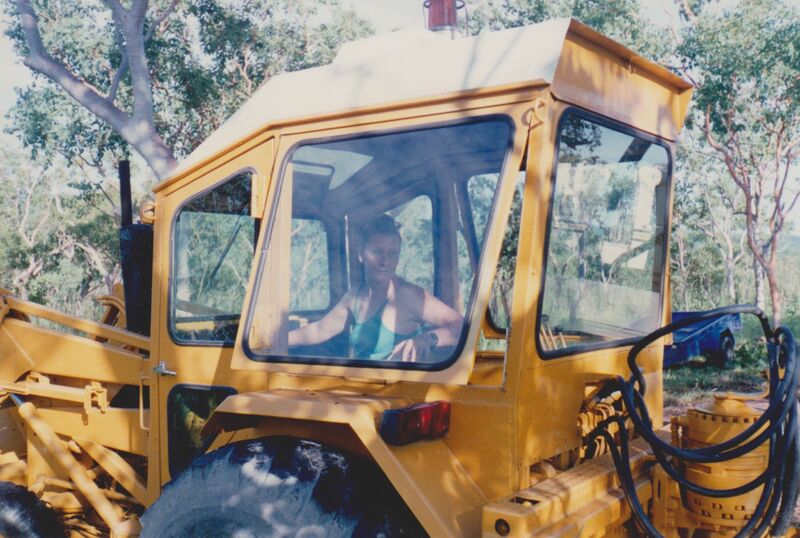 Here’s me driving the backhoe one weekend when Greg was home to take a couple of shots. 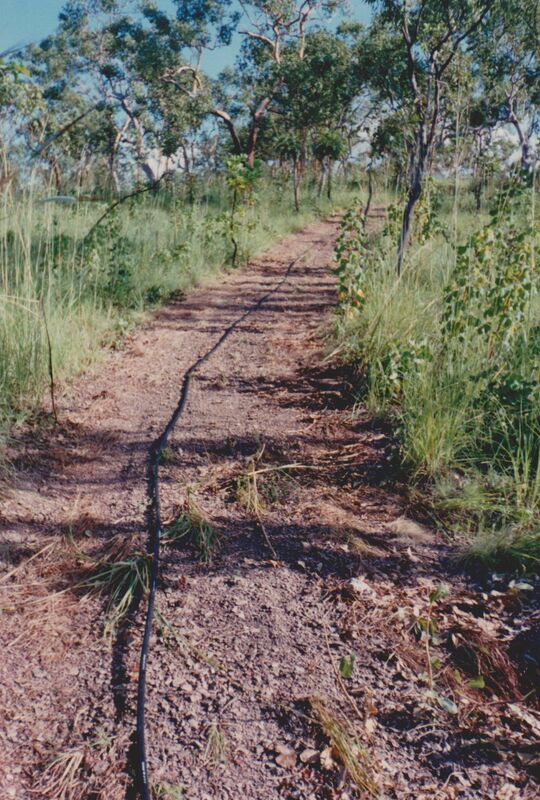 The hose shown in the earlier pictures was shifted off the road and I soon dug a trench for it to protect it from quolls, nocturnal carnivorous marsupials – very cute, like a possum, but with teeth like a canine (I’m sorry to say I cannot find any pictures of them that I took, but the Internet has some). The little buggers chewed holes in the hose, losing overnight what water we had collected. That not only meant redoing the water, but replacing sections of hose. The trench was essential. The backhoe was too cumbersome through the trees and I wanted a very narrow trench. 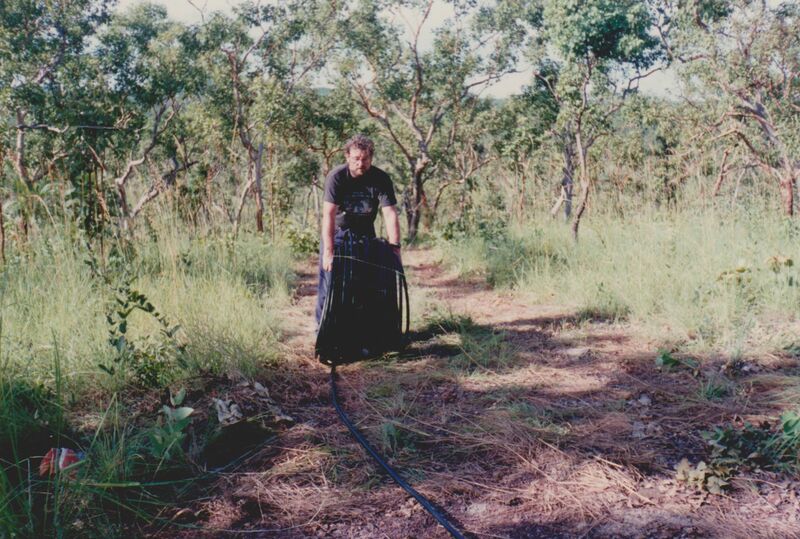 That task took some days, so I did it with a mattock, all the way from the tank to our camp (about half a mile). 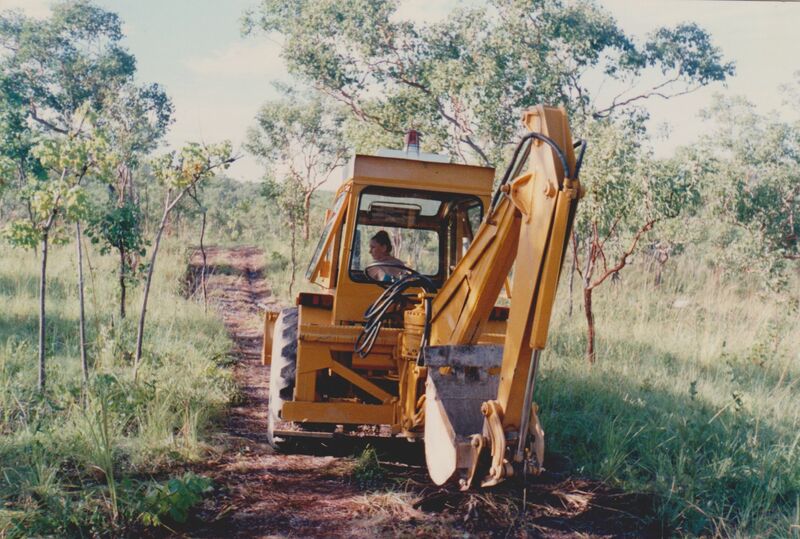 Here’s another of me in the backhoe, heading off to do something. I should imagine driving a tractor would be the equivalent of driving a backhoe, except that maybe it’s more fun to put down the bucket at the front or the digger at the back and raise the cab up instead of digging into the ground as intended. 🙂 Okay, more shocking, then. It sure is a surprise the first time it happens. LOL. Re appreciation – that was the biggest thing I learned, just how easy modern civilization has it, which is a marvellous thing. What kicked in for me right after that was the confidence these experiences grew in me when I could provide what modern society does. Water in the tank, electricity in the batteries. Simple little things, but – man – did it feel good to actually do it ourselves. I really grew up out there. To be honest, I think that’s where some of my characters get some of their backbone from (I’m thinking Sevi, now. Although she came into existence much later, I think her being able to cope with anything was born there). firstly, you look so cool while riding that backhoe, then the other things are look like my home and my job right now. we deal with backhoe everyday (remember i’m a miner :D), here, even i want to learn how to use it, i can’t since I’m not allowed by the rule, but once i managed to learn driving a big truck (which is tyre itself has diameter about 2 meter). the creek water overflow is something we fight everyday too 😀 and it’s getting wild in rainy season. it’s a half year of dry season there? looks like in Indonesia. 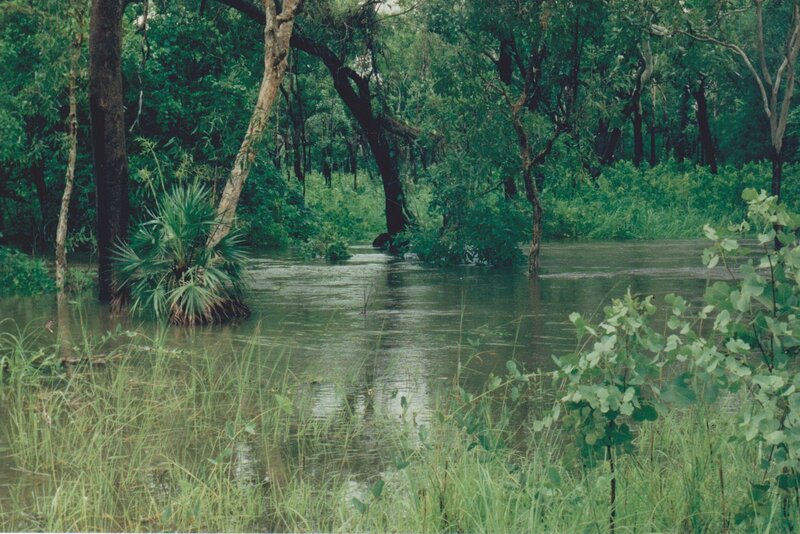 Yes, the Top End (the Northern Territory) has the Dry Season, followed by what we call The Build-up as we shift into the full-blown Wet Season when it is very hot and humid with plenty of rain and when cyclones are likely. Down south, though, where I am now, we’re back to the four seasons (which is boring compared to up north). LOL. 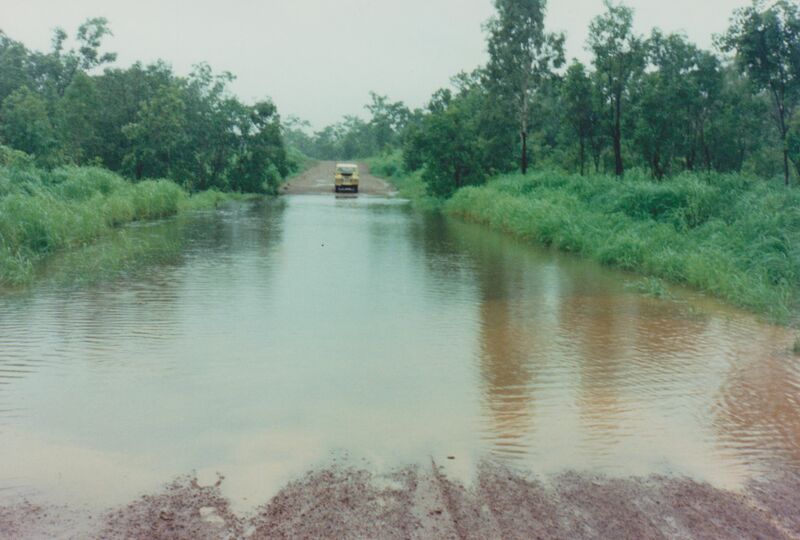 I learned to drive a truck – although not with such large tyres! Would that be one of those giant mining trucks? Ah, boy, I’d love to drive one of those, that would be like driving a skyscraper. I got my licence for semi-trailers – I learned in a 16 gear Volvo with a 30 foot trailer, which was like driving a two-storey building, but that’s the largest vehicle I’ve driven. why is it boring? i really want to live at the four seasons country at least a year (feel the whole seasons) 😀 :D, maybe because until now, i live in two seasons area :D.
yes, it is a giant mining truck ;). everything seems so small while driving the truck, and instead of its large body and shows to be hard to handle, it much simpler to handle than a manual light vehicle like car at first because everything has its own button 😀 :D. it gives “i-own-the-road” feeling, kekekekekeke. Yes, you would own-the-road for sure! Everyone would get out of your way. Yes, I have a licence for articulated vehicles (semi-trailers), which was an adventure, too, because I always wanted to drive one of those big trucks. The four seasons? Yes, boring. Tropical seasons are dramatic. Storms and rain through the hot months and lovely clear skies and perfect weather through the cold months – what’s not to love? It felt so cold moving down south and everything seemed too gentle with no spirit to it, except rarely. You see? I fell in love with the northern climate AND the land. cool, that’s really cool, the things about having a license for articulated vehicle, that’s the hardest one i think ini balancing the body of truck. Cool #thumbsUp!!! With the different seasons from different parts of the world, I guess the trick is to travel a lot – then see all the beauty of all the seasons. Allyson in a backhoe? You wowed me with you incredible ability! Yah, it may sound simple to do, but it is not that simple. I must commend you for sharing this adventure with us. 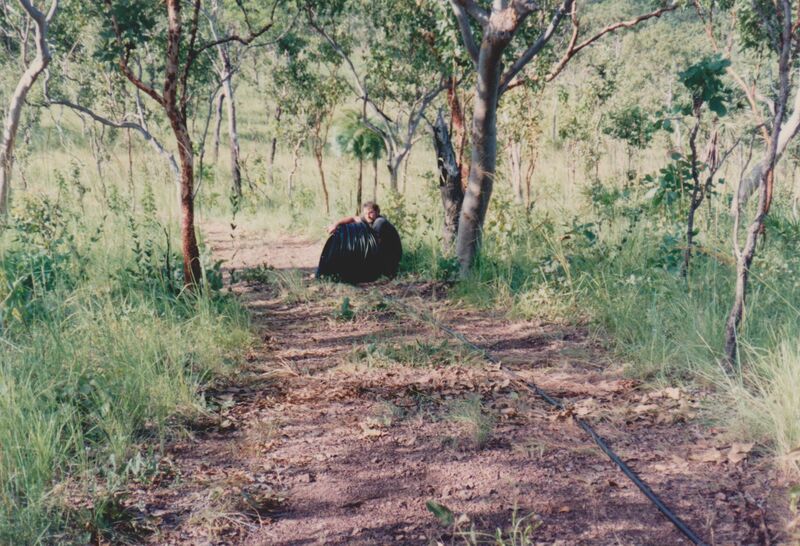 I’m still of the view that you can make a story out of this wilderness experience. I have taken note of your suggestion, although I feel such a story of our wilderness years should include something dramatic, like being half-eaten by dingoes or dragged into the creek by a crocodile – and as that didn’t happen (and I just can’t put fiction in non-fiction), it’d just be more snakes and bats under the bed. Maybe I should bring the tax-man into it. He was scary! [Yes, just joking]. That’s my lady — Allyson, the great! Yes, the wilderness story should be a dramatic one to keep the reader engaged. I love that you already mentioned the crocodiles, dingoes, snakes, and bats. Adding to that, here is my suggestion (though I am not sure if you are OK with the horror genre mixed with sci-fi): the main character waking up in a facility in this wilderness with very little memory of the past. All she know is that she has to escape because her captors are up to something dangerous. Maybe about carry out an attack so deadly on her country. In the process she finds out that she is not the only one in the facility-prison thing. Finally she escapes with a few of the friends she meet. Unfortunately they are pursued minutes after escape. Their battle for survival in the wild now takes center stage at this point. Ah! it’s all coming in … Perhaps a bland idea too. I shall let it brew in the background. So far, the closest character to have come to this level of experience is Mij in the opening of book two – she’s 13 and she and her mother are stranded in the wilderness with no power, no transport, no money. Mij hunts and traps animals for food. Her mother gathers herbs, makes medicines and then walks long distances into the nearest town to barter them. And the war has come to their world – the Khekarians are moving in and will take them as slaves.